View from White River Campground before starting the trail. Two weeks ago Kyle, my brothers Nelson and Cameron, and I completed the Wonderland Trail in six and a half days. Since we have now been to the top of Mt Rainier it seems fitting that we took a week out of our lives to walk around it and see it from every side. Or as Nelson informed us while we walked, we actually circumambulated it. Putting the whole story down in one post would be a monstrous undertaking so I will stick to the basics for now and split the trip into two. Nelson and I arrived at Longmire on Monday, August 10th, to drop off our food cache. The rangers accepted our buckets and shared that all the wildflowers had already died but due to the unseasonably hot summer we were having there were also no bugs to be found… we didn’t know whether to jump for joy or despair at the changes taking place in our world. We then continued towards White River Campground where we would spend the night before starting out the next morning. Cameron and Kyle showed up a couple of hours after we had picked out a camp spot, set up the tents, weathered out a thunderstorm and eaten half a bag of Juanitas. For our entertainment that night we attended the park geologist’s talk on Mt Rainier, and learned about the memories of the area that are embedded in the rocks of the park. We then wandered to the river to catch our first glimpse of the mountain. The river bed, wide and rocky houses the current path of the White River, and old log bridges lay scattered amongst the stones, showing how temporary and short-lived any human creation is against the power of the mountain. 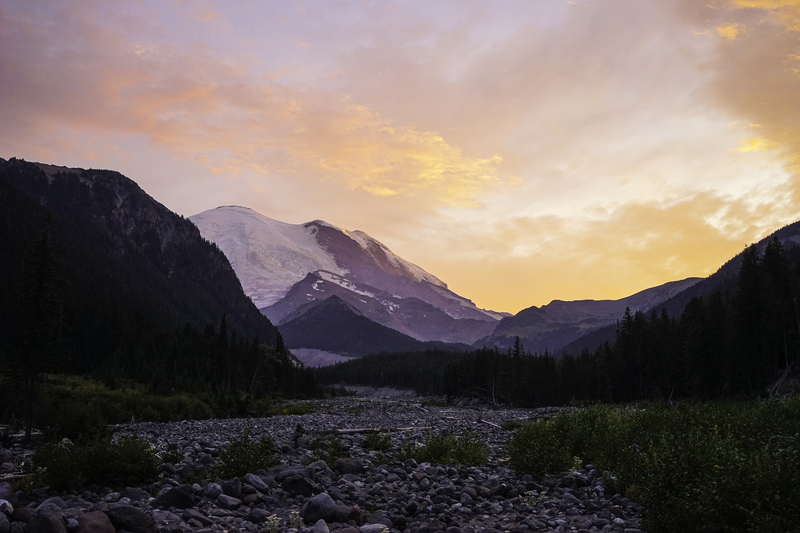 We were greeted by Rainier and the Winthrop Glacier, painted pink and sherbet orange in the setting sun, wisps of clouds moving across the summit. Cameron exclaimed in shock, “That’s Mt Rainier!” When one has spent their entire lives seeing the mountain from far away, memorizing its height and breadth, learned where the snow and the rock lay from one specific viewpoint it can be shocking to see it from up close for the first time, to have its height diminished but its mass amplified and its crevasses clarified. It somehow becomes more intimidating but less remote and mysterious. Cameron started at it and turned to us, “I can’t believe you climbed that thing” and behind him we heard rock falling somewhere far above. The next morning we woke up at our leisure, a move that would set a relaxed pace for the rest of the trip. Although everyone seemed horrified that we were starting from White River and facing a 2,000ft elevation gain in two miles we didn’t get started until ten after a fabulous breakfast of scrambled eggs and sausages wrapped in tortillas. Once we finally hit the trail we did find ourselves climbing up to Sunrise but the grade was mellow and we just kept telling ourselves: only ten miles today, a nice warm up for the rest of the trip. Or so we thought, once we reached Sunrise camp and took a snack break we re-did the math and learned that we actually had twelve miles to accomplish our first day. We should have known then that never exactly knowing what our mileage was for the next day, thanks to discrepancies between the map, the elevation profile and the park signs, was going to be another theme of our hike. Leaving camp the first morning. Obligatory parking lot timer photo. View from the trail up to Sunrise. Burroughs Mountain with Rainier in the background. Heading down to Mystic Camp. That day was spent hiking by Mt Burrows, Mt Fremont, Skyscraper Mountain, and then down to Mystic Lake Campground. The landscape up in that area of the park was unlike anything I had seen so far at Mt Rainier. The East and North East part of the park is drastically different then other areas we would soon walk through, it is drier and much of the trail winds above tree line through rocks and rubble. You can see the trail, stretching away from you and climbing up the sides of mountains for miles and to your left, ever omnipresent is The Mountain. Our first day out we saw mountain goats grazing and were startled by a marmot who seemed interested in getting some treats from us. We made it to camp in good time, all exhausted, perhaps a little dehydrated, and ready to take our shoes off. That first night was a learning night: learning how to set up the tents, learning how to hate filtering water and just aquamira-ing it instead, learning how to take care of ones feet, how to juggle cooking multiple meals on two stoves, how to stay up until the sun starts to set. Nelson had been backpacking a couple of times before the Wonderland Trail but had never done anything so extensive. Cameron had never been backpacking at all so he had chosen quite a place to start… We were in our tents early and only got out to put our backpacks away when it started to sprinkle. The next day we got up around seven and after making breakfast and packing up we were back on trail by nine. We had a longer day that day, fourteen miles, and were planning on heading through Spray Park instead of staying on the true Wonderland Trail that goes through Ipsut Pass. This is a common detour and only Nelson had been through Spray Park before so we thought it worth it. We crossed over the Carbon River on a swinging suspension bridge, the silty water pounding rocks sixty feet bellow us. The Carbon River is the Northwest corner of the park and, although seemingly close to the drier climes of Sunrise and Summerland the Carbon river is surrounded by old growth rainforest. Once across the bridge the trail turns sharply uphill and we began what felt like the longest steepest climb of our Wonderland hike. It climbed up through woods, sometimes clear and open and sometimes choked with Salmon Berry and Deer Fern. Eventually we popped out of the woods and begin to climb through Seattle Park, a terraced area dripping with streams and blanketed in bear grass and heather. After that we climbed into the moonscape that is upper Seattle Park and crested a ridge, and finally stood looking down on Spray Park. The special part of our second day, apart from the stunning views, was that it was the day we would meet up with my Mom and the Wonder Women (self-proclaimed) and continue with them to our camp that night at Mowich Lake. Mowich Lake used to be a car camping spot until it was turned into a walk in campground, with a parking lot located near by to the tent pads and picnic tables. My dad and one of the Wonder Women’s husbands were going to meet us there with a full pot of chili and other goodies one couldn’t carry in a pack. We didn’t expect to see the women until later in the day because they had a good four mile head start on us but we saw them at the top of Seattle Park, or more accurately heard my mom whooping and hollering when she saw us from above. We hiked with her and some of the ladies for the rest of the day, keeping our eyes peeled for a cinnamon colored black bear that was rumored to be hanging out around the start of the park. We didn’t see it and thus were introduced to the third theme of our hike: being told there was a bear just around the corner but never seeing it. We reached Mowich shortly before my dad and Joe showed up, set up our tents, fought off some Grey Jays, and went for a dip in the lake. After a delicious dinner of chicken chili and guacamole we had a rousing conversation about names (turns out I am named after the Bionic Woman), hung out by the lake until dark, and then watched the meteor shower from our tents, struggling against our eyelids’ desire to shut. The next morning we got up and massacred a couple of egg sandwiches before wishing the women farewell and heading down the trail. It was the last time we would see them because they had a laid back three-mile day and we were continuing on to the North Puyallup, fourteen miles away. Or so we thought, until we redid the math during a snack break and realized that we actually had a sixteen mile day to look forward too. Despite the added miles that had materialized out of nowhere we decided to stop at Golden Lakes for a dip. Swimming in the heat of the day felt wonderfully refreshing, especially after the long climb up to the lake. We hung out as long as we could before heading out and it was at this point that Kyle confessed he was getting a migraine. We filled him up with meds but I could tell it was getting worse so I let the boys go ahead while Kyle and I made our way more slowly down to camp. Luckily it was a mellow downhill to North Puyallup. 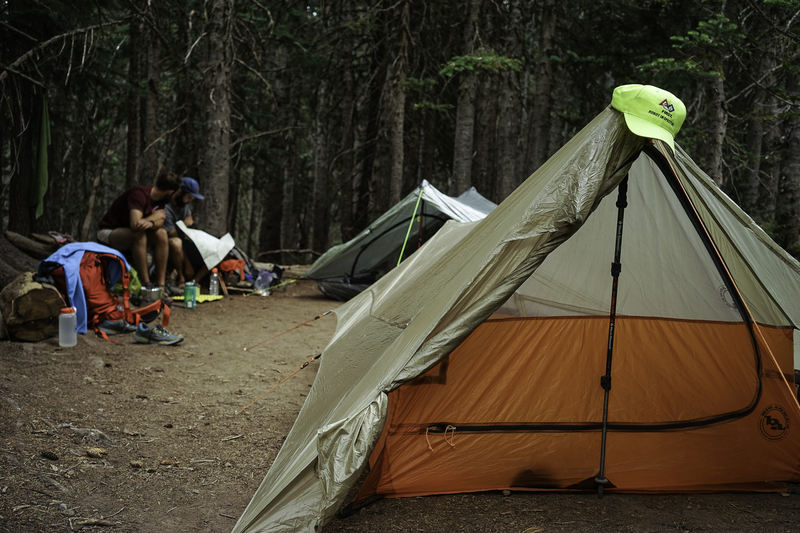 When we finally pulled into camp they had picked out a site and strewn their gear all over the place, the way any good backpacker learns to do. I quickly set up the tent so Kyle could lay down and the boys and I went and collected water from the coldest spring we had encountered yet. It was so cold that your feet ached after only a couple of seconds submerged in the flow. By the time we got back Kyle was feeling a little better and joined in as we all talked in German accents, inspired by a German family that was camped back at the beginning of the campground. We also tested out a pasta sauce that I had dehydrated myself, which rehydrated very nicely. The last picture taken before the camera got stowed away on our rainy day. The next morning we woke to a heavy mist floating in the tops of the trees and upon reaching the bridge spanning the North Puyallup bellow we discovered we could see none of the peaks or glaciers we saw the night before because everything was covered in a thick layer of clouds. As we each made the morning visit to the privy the clouds drifted lower and lower, thwarting Cameron’s assertion that, “It would burn off!” and misting us with fine droplets. We attempted to escape into the trees only to be greeted by switchbacks lined with wet thimble berry and elder berry plants, soaking us from head to toe. Finally, as real rain drops began to reach us through the canopy we capitulated, donned our rain jackets and threw rain covers on our packs. The morning continued uneventfully until suddenly, mid story, I heard a blood curdling scream from behind me! Your photos are awesome! How do you not grown tired of taking the photos as you do these long hikes? I find that if I am on a particularly grueling hike or am exhausted from traveling, the photos fall by the wayside as it seems not worth it to deal with. Does this happen to you? Yes, it does! We certainly took less photos and video at the end of the AT then we had in the beginning. But for the most part our photos and video were a form of on trail entertainment. Every couple of days we would get the camera out at night, in the tent, and scroll through our photos and watch our videos. That kind of kept us motivated to keep taking pictures. Also, when you are walking all day every day, with very little else to do, taking a picture or a video can kind of mix things up 🙂 And when you have a blog you are motivated to take gorgeous photos so there is something to show, visually. My biggest piece of advice is have your camera super accessible while you are hiking, so it isn’t a burden to take it out or put it away and you can do it while you are hiking. This will make you far more likely to take pictures frequently! Nicely done. It’s a beautiful trail. Glad you had a chance to enjoy it. Beautiful photos! 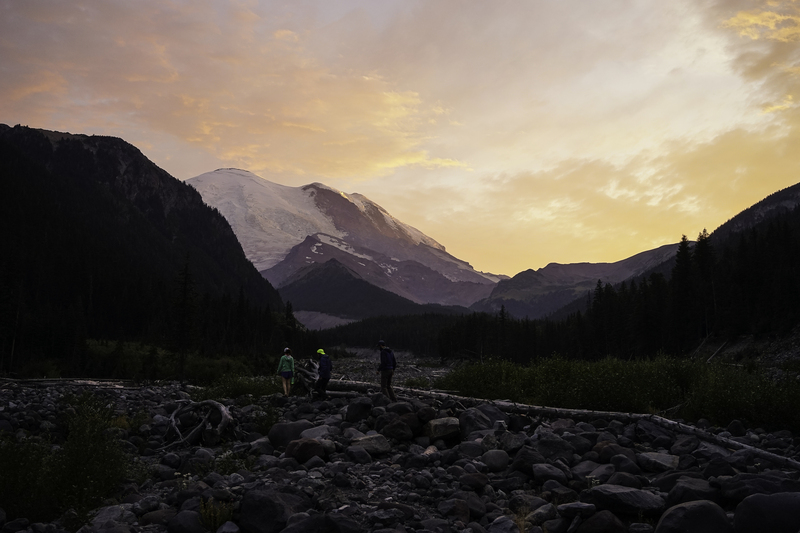 Rainer is def on my Bucketlist to summit! And I thought the wonderland trail takes 90+ days?? Haha, it is 93ish miles, maybe that is what you heard and just misconstrued it in your mind? It is pretty common for people to do it in 10-13 days though! Awesome commentary! Oh, it brings back memories. For awhile it reminded me of my Colorado climbs and trips. My first trip out, we hit rain up near Telluride and when we got back into town, everyone stripped down to change in the parking lot. I was aghast, but they reassured me no one really looks. Your fanny pic belies that, LOL! Hee Hee Hee….I know what is going to happen! Was so fun having the family out there that week. We’d send messages ahead or try to garner information after they passed us by. Great memories. Bear in his pants? Great post – look forward to the next one! Great photos and an incredible trip report. I’m looking forward to the next segments. After finishing the JMT this summer, I’ve been looking for some nice adventures for next year. This one is high on the list of possibilities.